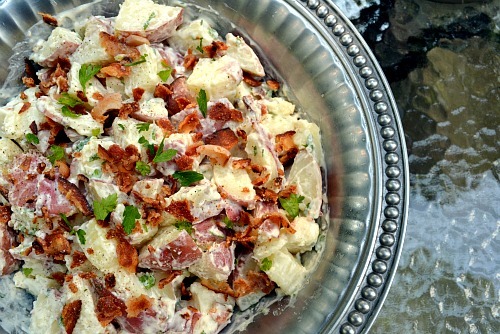 Your stories about your parents’ potato salad reminds me of my attempts to recreate my mom’s potato salad. My husband once asked me mom for the recipe and she sent him home with this ambiguous list of “add some mayo, a little horse radish, however many eggs you have in the fridge.” I was convinced that she was sabotaging my attempts! 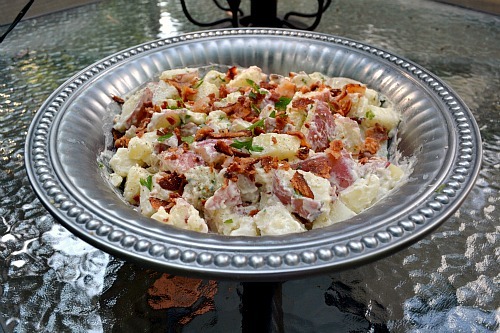 I, too, have decided to let her keep the potato salad secret close to her heart and go for a totally new recipe and bacon ranch sounds really good! This looks so good! I don’t usually like traditional potato salad either but I could definitely wrap my head around this one! Glad yall had a fun long weekend. Yummy! I also struggle with traditional potato salad recipes. I have tried a few but nothing tastes like my neighbor’s. This looks easy and different enough with the ranch to be fun. I bet a dash of hot sauce would be delicious too. Although, you know the feta potato salad is my go to!